Members: Richard Simoneau, trumpet; Curtis Dietz, trumpet; Gina Patterson, horn; Eric Mathis, trombone; Bob Nicholson; tuba & bass trombone. Type of music: classics and light classics, popular, ragtime, tango… all things fun! 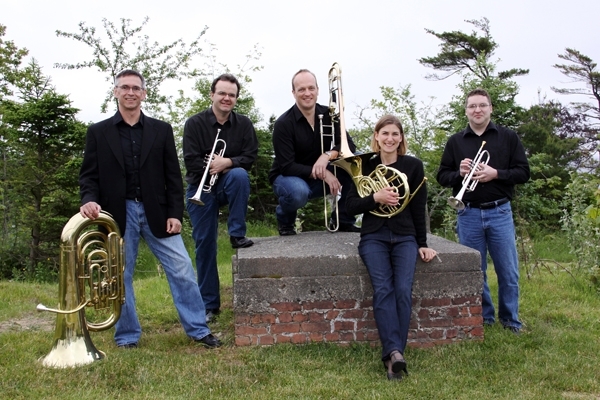 The Maritime Brass Quintet can provide a wide variety of high-quality chamber music for your event – both popular and classical. Whether you’re looking to enhance your private event or church service, or if you’d like an entertaining and educational concert at your child’s school, the MBQ can fill the bill!MBQ members have studied throughout North America and performed or held positions with many of the world’s leading ensembles, including the Chicago Symphony, Toronto Symphony, l’Orchestre Symphonique de Montréal, National Arts Centre Orchestra, Honolulu Symphony, the Canadian Opera Company Orchestra and Symphony Nova Scotia. They also have experience playing in numerous smaller groups and ensembles, including the Foothills Brass, Northumberland Brass, Honolulu Brass Quintet, the Jive Kings and the Canadian Brass.